We have been voted #1 on many occasions by the Oakville Beaver readers and Readers Choice Awards. Why ? Because we have the best prices , best service and best tanning beds for tanning in Oakville and Mississauga. No "weak tanning bulbs" at this salon - ever. Great Prices and Great Tanning Results, every - time ! We are located near the Oakville / Mississauga border and for most of Oakville you are only a short 5 to 8 minute drive for the best tanning salon in the city. Drive a little - Save a lot. Do you have any questions about tanning beds ? We have many Mississauga tanning clients and Burlington tanning clients that say the short drive is worth the great tanning results at our tanning salon. Our true reward is all the fantastic tanning customers who have been so loyal to our tanning salon over the years. We are lucky to have the nicest people in Oakville Mississauga and Burlington as our tanning clients. "The tanning beds are amazing ! very clean! staff is always friendly and helpful. I always get a great tan and love this tanning salon. I wouldn't go anywhere else." "Hi Joe. I wanted to thank you for providing such a great tanning salon experience. From the great care in keeping your place super clean, fantastic tanning beds and the results, to your expert knowledge. I really appreciate the great advice with respect to lotions and tanning time. Always great results and I never burned! Keep up the good work!" "Very friendly service. amazing beds, always strong tanning bulbs, always clean, the best tanning salon in oakville"
"That SATURN tanning booth is simply AMAZING the best bed I have ever used and such a long lasting tan"
Featuring some of the worlds finest tanning beds - the Ergoline Excellence 850 and Ergoline Excelence 880 tanning beds. These beds make an impression with eye catching design and cutting edge technical innovation for 20% better tanning results then other Ergoline beds. Want A Tan in 3 - 4 Visits!!! The Worlds Most Luxurious Tanning Bed! - Open Concept - Non Claustraphobic. - For Those Who Want The Best ! 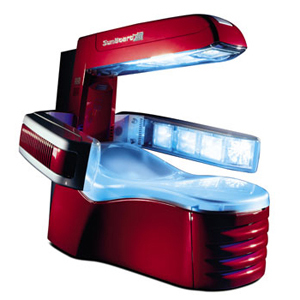 The Sunboard XTT High Performance Tanning Lounge is the world's most luxurious tanning bed. Want more information about all our ... TANNING BEDS. Guaranteed NO BURNS - Try High Pressure Tanning! 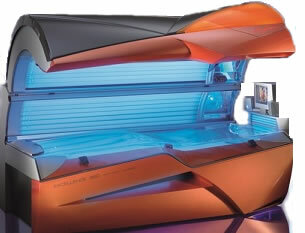 The Saturn Hp is considered one of the absolute best tanning salon beds available. It gives MAXIMUM Tanning results in a very gentle tan without the burning potential of UVB rays. For more detailed information about our line up of tanning beds click there =>... Best tanning beds. Are you looking for the "Best Spray On Tan in Oakville, Mississauga" We offer the best spray on tanning booth we could find. The new Mystic Tan HD. It gives you a beautiful spray tan with a dryer right in the booth so your spray tan is dry before you leave. Treat Yourself To A Luxurious Spray On Tanning Experience! Nature intended mankind to get vitamin D through regular sun exposure. One non-burning, full-body exposure to sunlight or tanning lamps can create as much as 20,000 IU of vitamin D in our bodies. ( more than 100 glasses of milk!) If this weren't important, why would nature create so much of it? Total sun abstinance is deadly advice according to vitamin D authorities . © Copyright 2002 - 2011 Tan in the Wild Tanning Salon 511 Maplegrove Drive Oakville Ontario, L6J 6X8. All Rights Reserved.